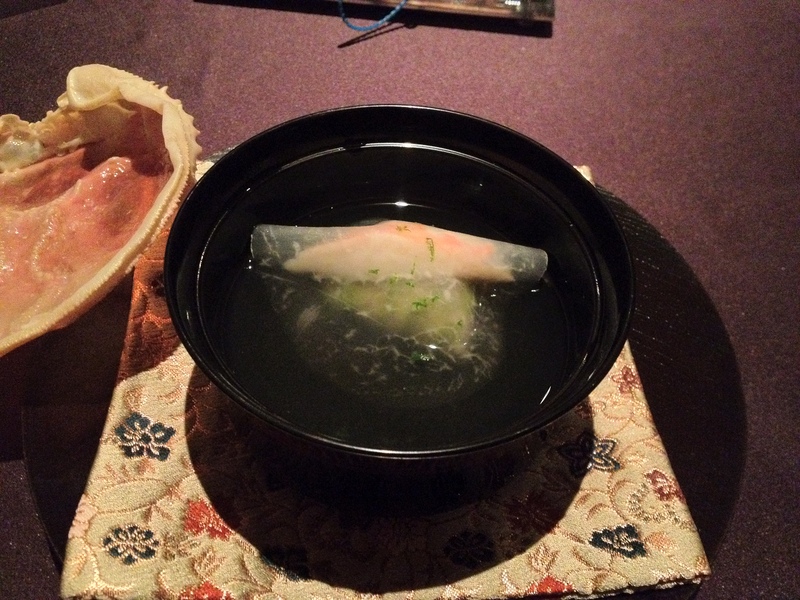 -I’m trying to hit up a few kaiseki and sushi restaurants while on my Asia trip this break, and this restaurant was one of the ones I was most looking forward to. My anticipation, it turns out, was justified. 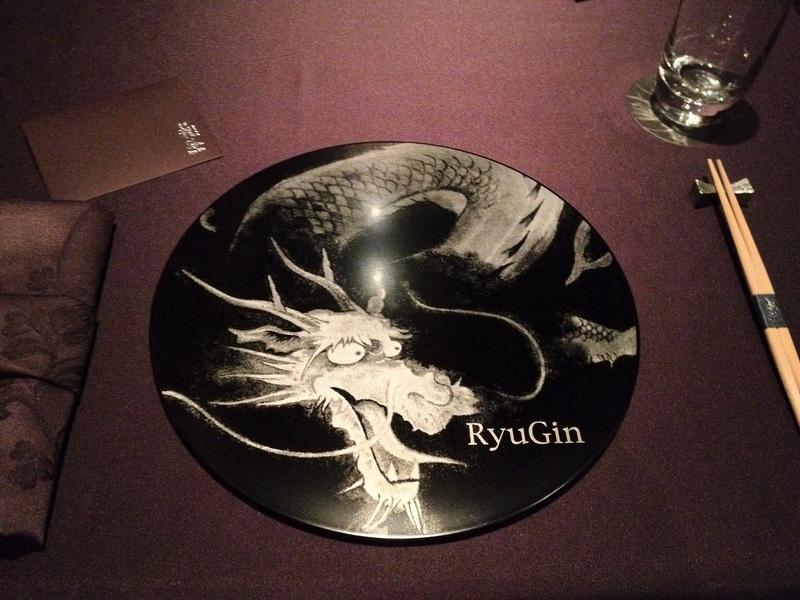 -Nihonryori RyuGin is a famous kaiseki restaurant in Roppongi, and I really wanted to try their Hong Kong branch, which happened to be only their second restaurant! I use the word “delicious” a lot in my descriptions of the courses. I really can’t help it. That’s what everything was: delicious. The ingredients were really fresh, the execution was perfect, and everything really was delicious. This was INCREDIBLE cooking, and I’m really glad that I’m lucky enough to be able to experience it. This meal is one of my top five meals of all time. 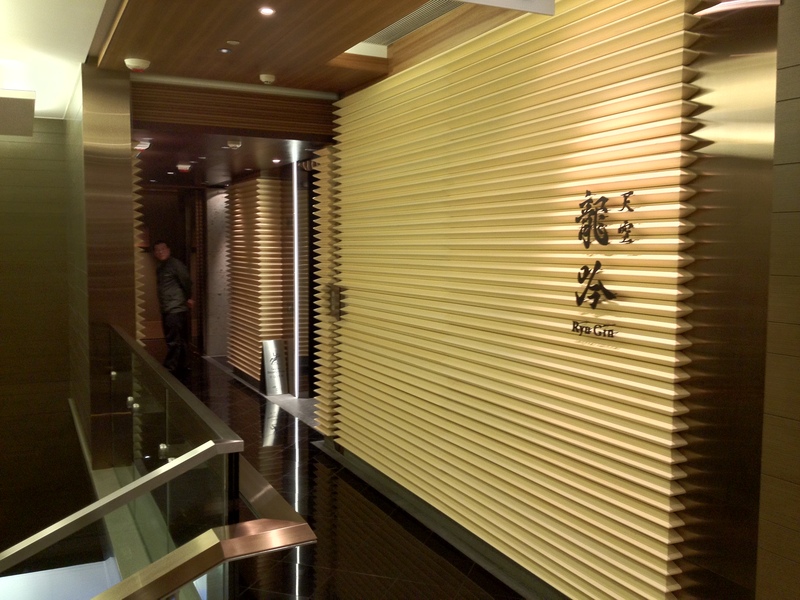 This is the outside of the restaurant; we were in the ICC 101 Sky Dining lobby. 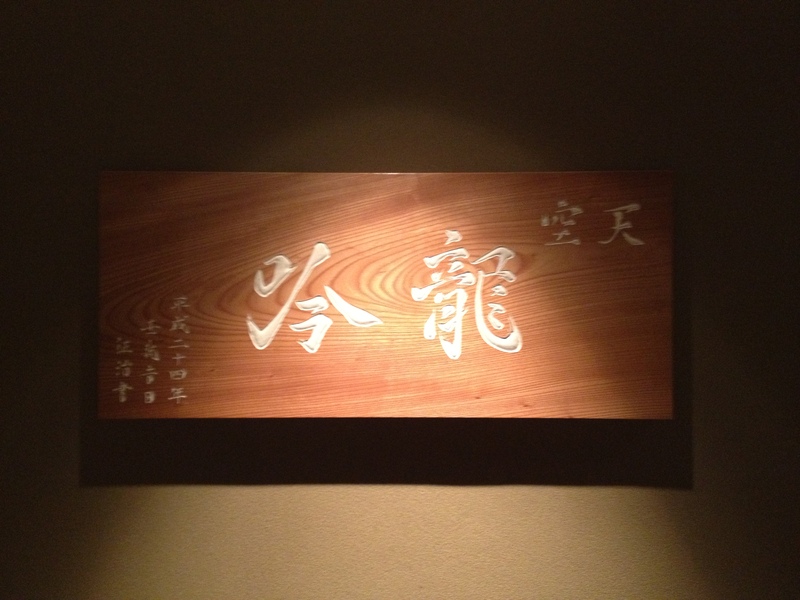 This was a sign at the entrance of the restaurant. 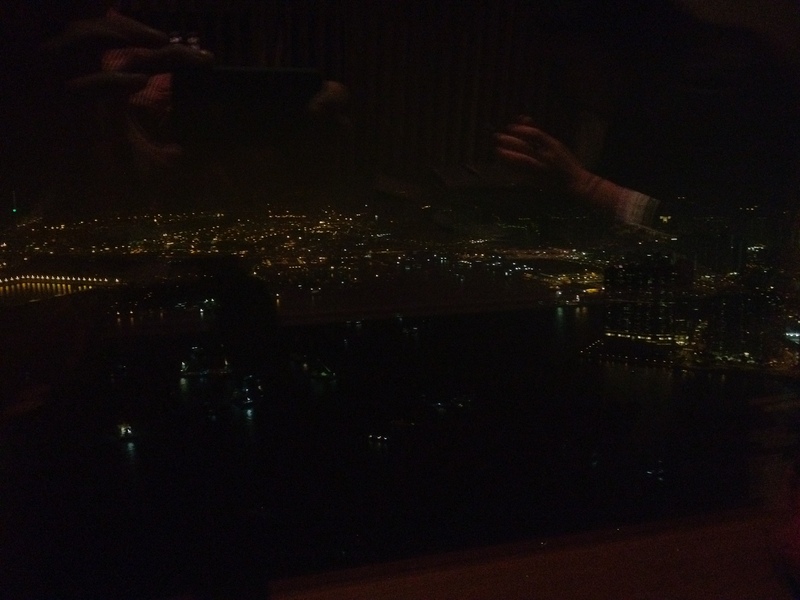 We got a window table, which had a fantastic view; we were able to see a lot of West Kowloon and the river. 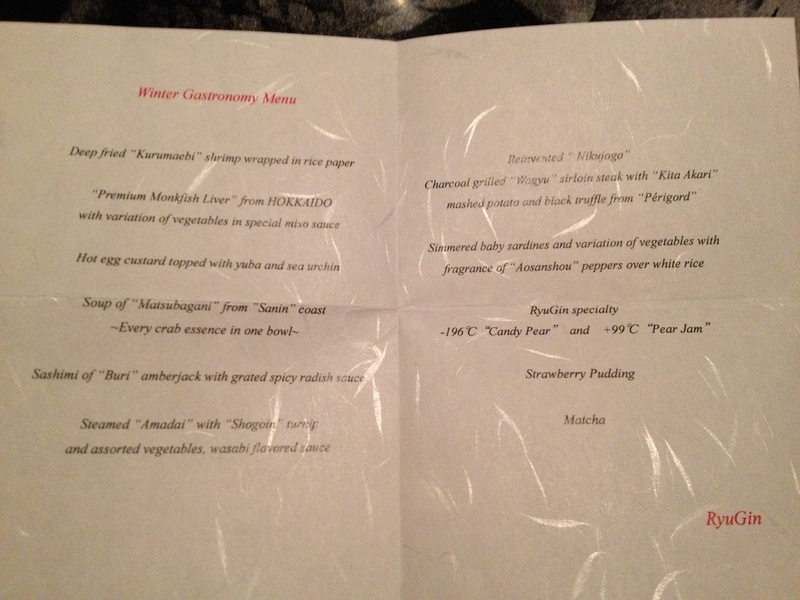 Upon sitting down, we were faced with this plate and an envelope that contained our menu for the day. 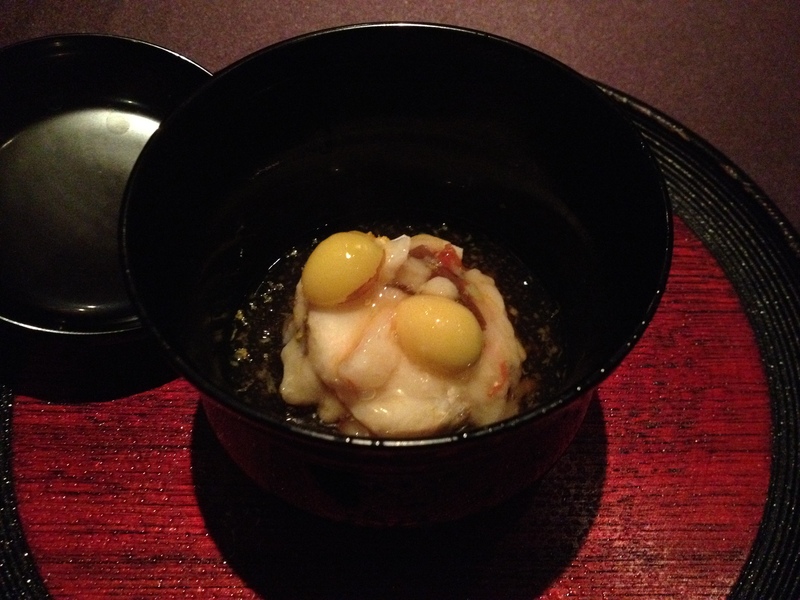 This was the best monkfish liver that I’ve ever had in my life. It was intensely flavorful and creamy, the vegetables were very fresh, and that miso sauce was amazing by itself but still managed to be a wonderful complement to the monkfish liver. 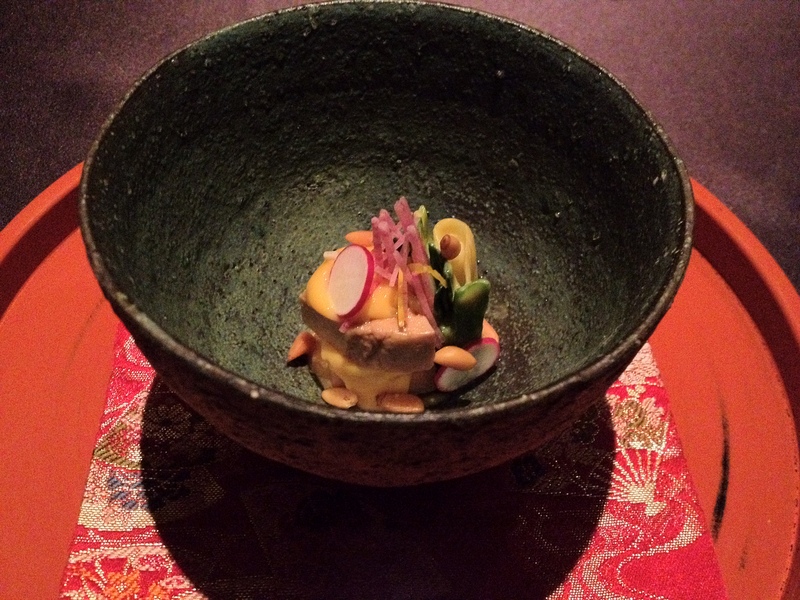 You know how they say that monkfish liver is the foie of the sea? 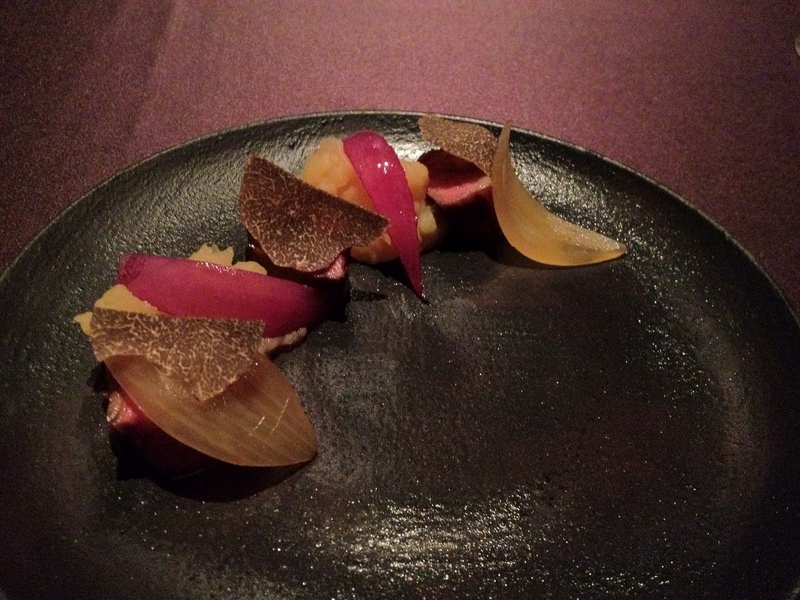 This dish has convinced me that foie gras is the monkfish liver of the land. 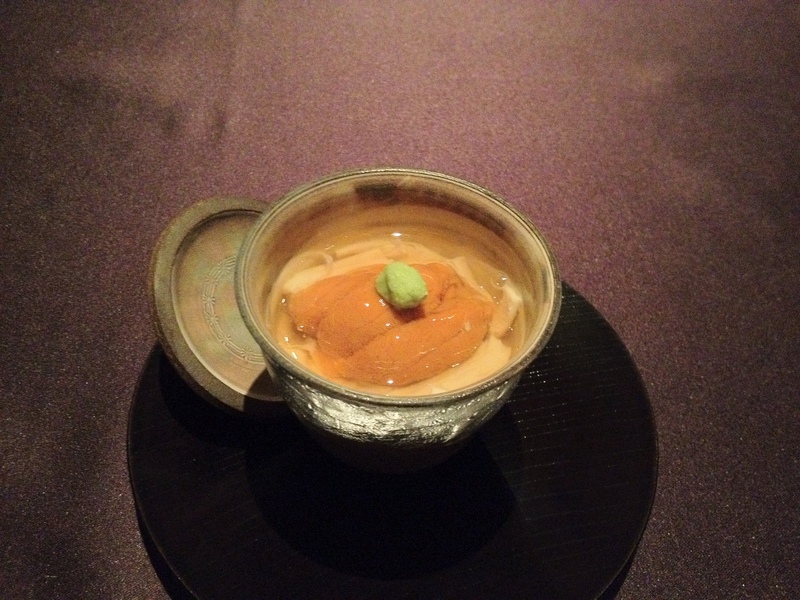 The chawanmushi was very well-cooked, and the uni was delicious. The yuba was key to this course; the layers of tofu skin added a kick and complexity to what would otherwise be a delicious but relatively boring dish. 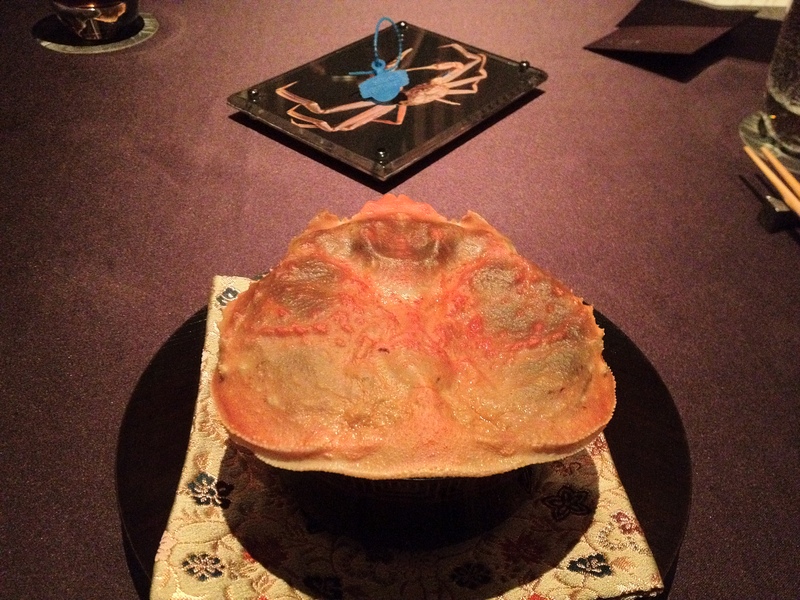 You’re supposed to lift up the crab shell and enjoy the soup underneath. A layer of radish covers one of the crab claws, and I THINK underneath that is lettuce that surrounds some crab meat. 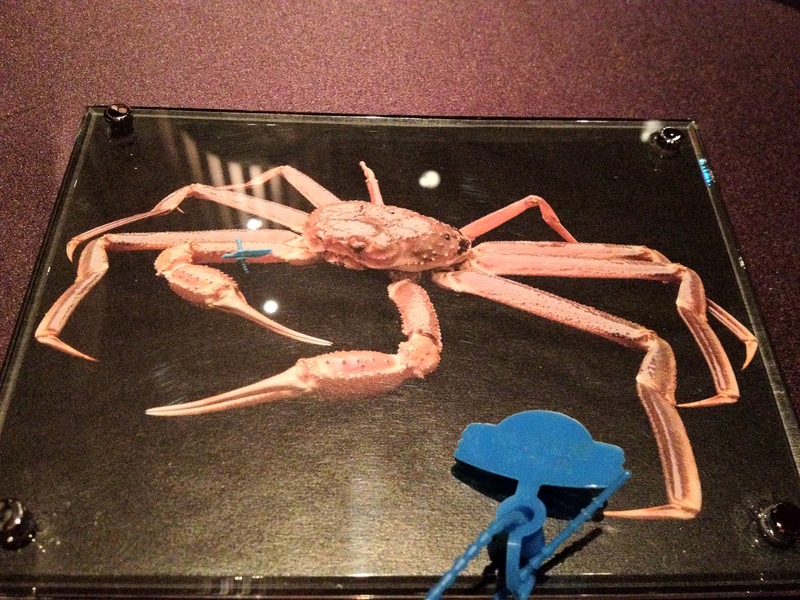 The picture is what a snow crab looks like, and the blue tab is proof that we had a snow crab from the San’in region. 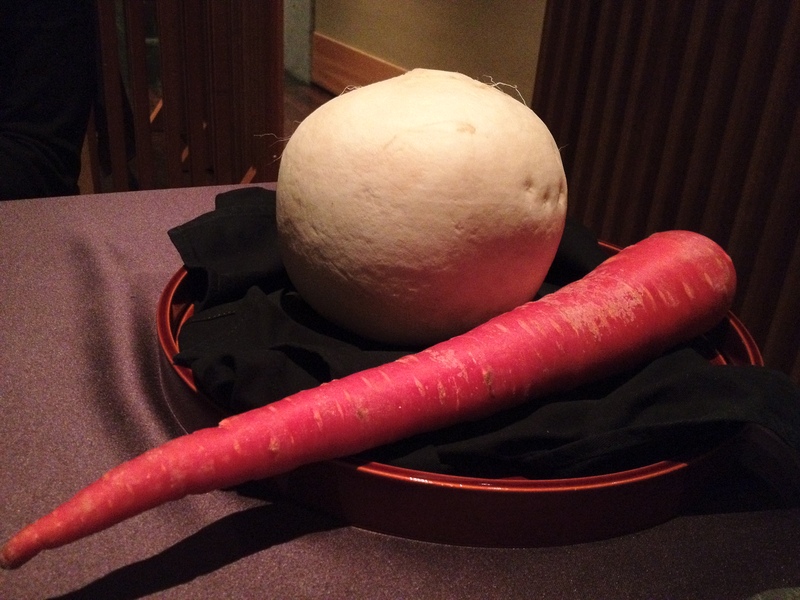 The chef recommended that we eat the fish with the radish together, so we did just that. And boy oh boy are we glad we did. 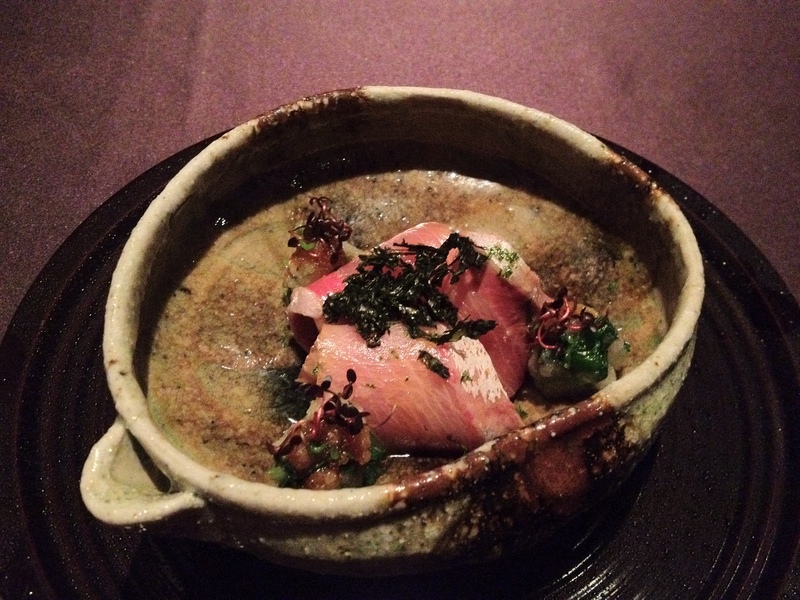 The hamachi already was amazing, but… the combination of the hamachi and amazing radish sauce? OMG OMG OMG. That was BY FAR the MOST delicious sashimi I’ve had in my life. It even beats out almost all of the high-end sushi that I’ve had in my life. This was hands-down my favorite dish of this meal. It may very well end up being the most delicious thing that I will have eaten in 2013. 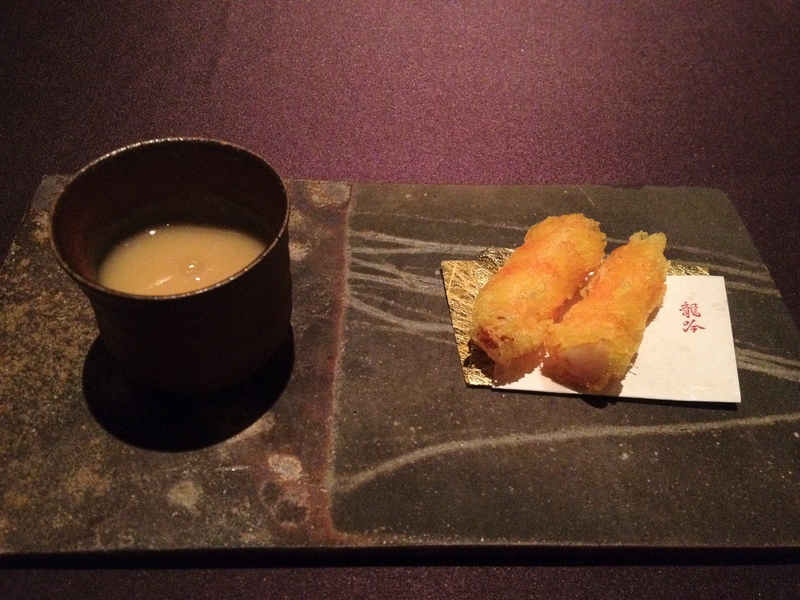 They showed us the turnip that they used to make this dish and… something else. I’m not really quite sure what that was :(. The wagyu was tender, juicy, and delicious, and the potatoes and truffles added some needed complexity in flavor to this course. However, I still have to say that I liked the wagyu tenderloin, wagyu sirloin, and ox tongue course that I had yesterday at Wagyu Kaiseki Den more. I think it’s because that one had more variations of meat, and each variation there was similar to the wagyu in this dish (in terms of how much I enjoyed it). 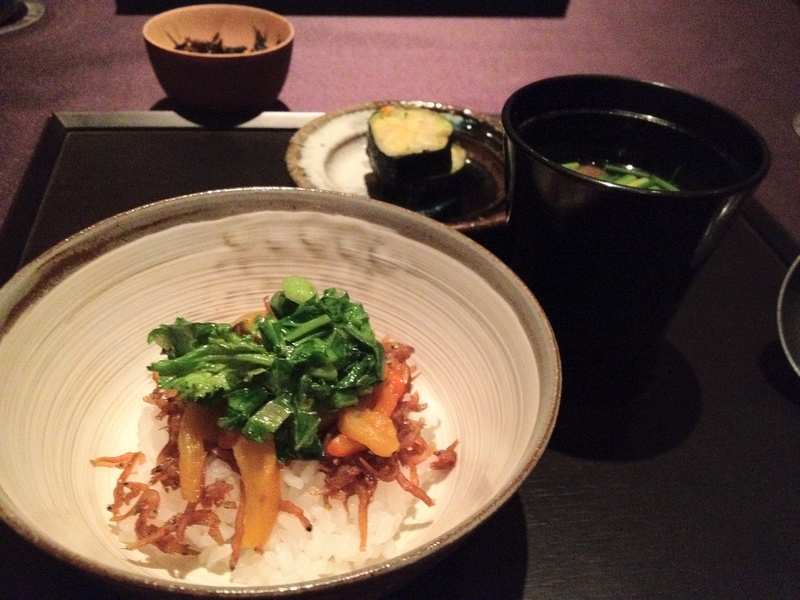 The dried sardines, vegetables, and sansho peppers provided a nice complement to the rice. This dish didn’t really feel as complex as the other ones, but it was really delicious and executed perfectly. It felt like I was enjoying a delicious (and perfectly cooked) bowl of rice with some side dishes, as if it were a meal that my mom prepared for me! This is a dish that manages to be an example of really high-level cooking while managing to seem home-made and simple. 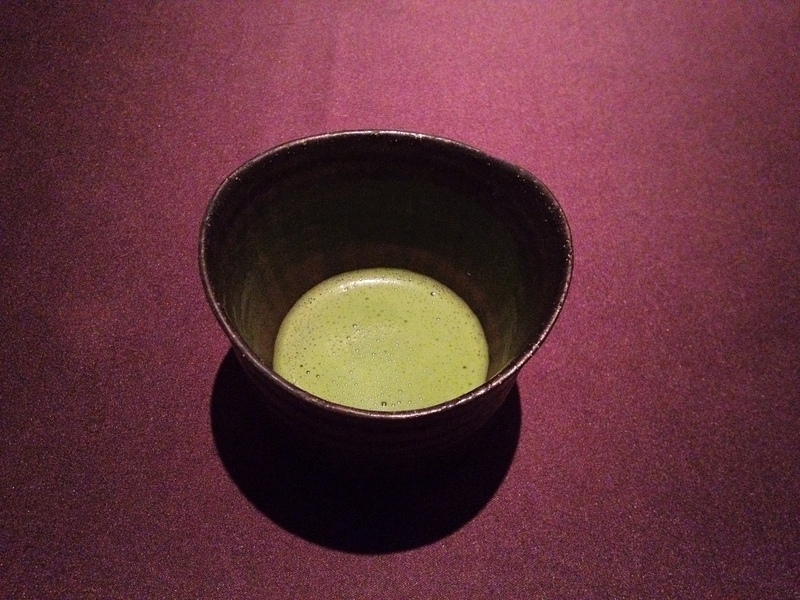 In preparation for the desserts, they started serving us green tea. This was a fascinating dessert. 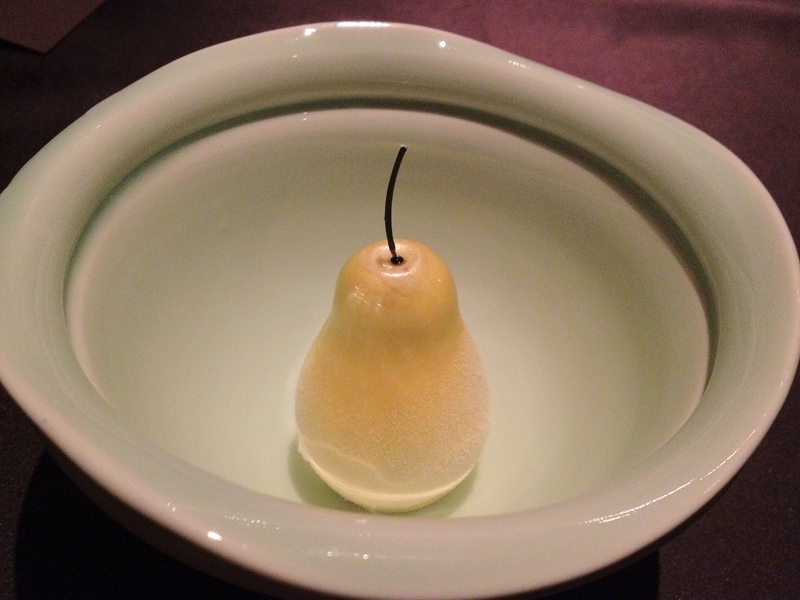 The “candy pear” consists of pear candy surrounded by sugar. It’s made using liquid nitrogen, and it’s made at a temperature of -196°C. You’re supposed to first break the “pear” with your spoon, and then the server pours hot +99°C “pear jam” over the freezing pear candy. You’re supposed to mix the two a bit and then enjoy the dessert as soon as possible so that you can fully enjoy the contrasts in temperature, flavor, and texture! This is probably one of my favorite desserts of all time. This was a complex yet seemingly simple dish, and it was delightful to eat. 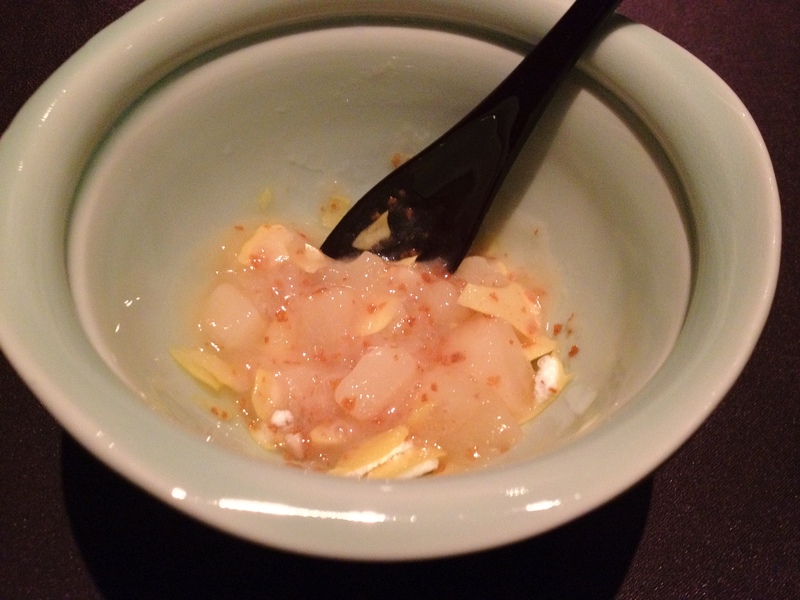 The dessert actually was changing over time because of how the cold “candy pear” was reacting to the hot “pear jam”. The dessert managed to be cold at times and hot at other times (as intended), but at all times it was delicious. 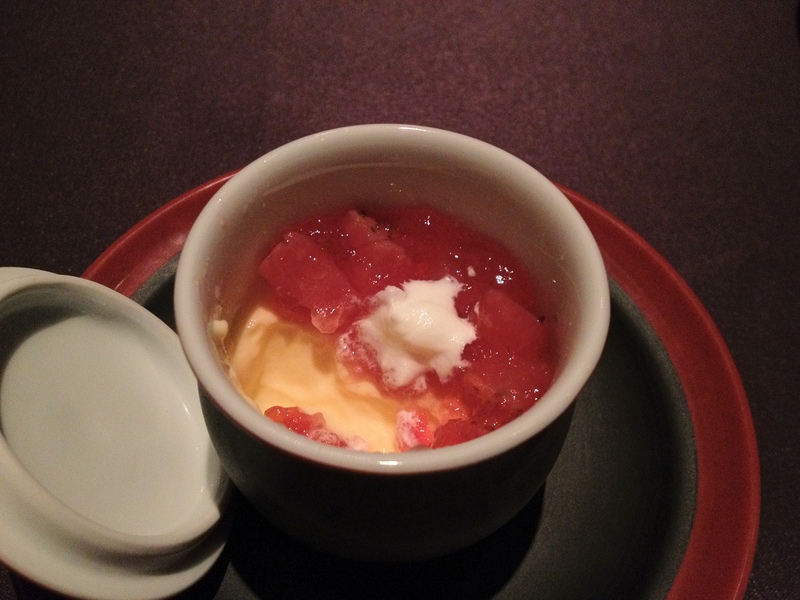 In contrast to the previous course, this dash was considerably simpler—it was just strawberry pudding under strawberry sauce, topped with whipped cream. Still, it was really enjoyable. 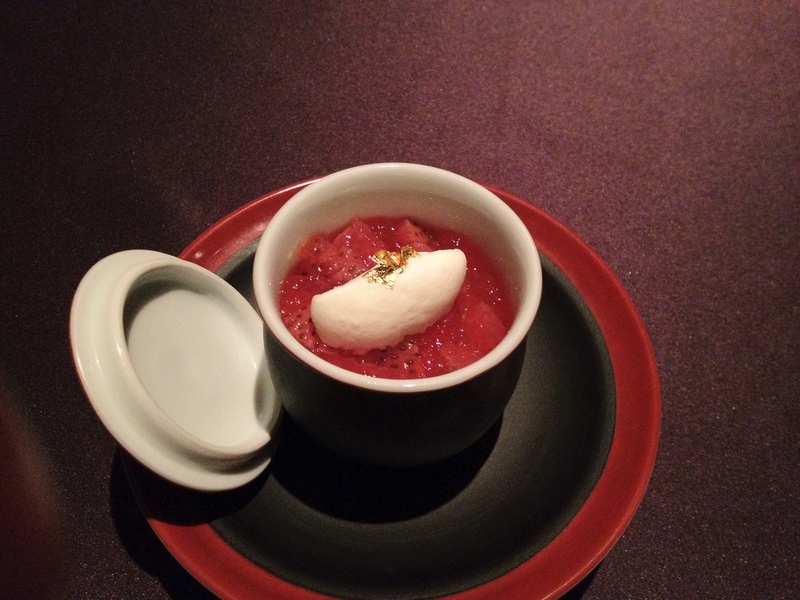 The pudding added a nice contrast in textures to the strawberry sauce. It didn’t seem too sweet, yet it also didn’t need to be any sweeter; the dessert really hit that perfect balance of sweetness.